Another view of the Third Avenue Bridge. Really love this vantage point with the wide angle lens. This is two HDR images merged together. One was processed for the sky and the other for the bridge and ice in the foreground. 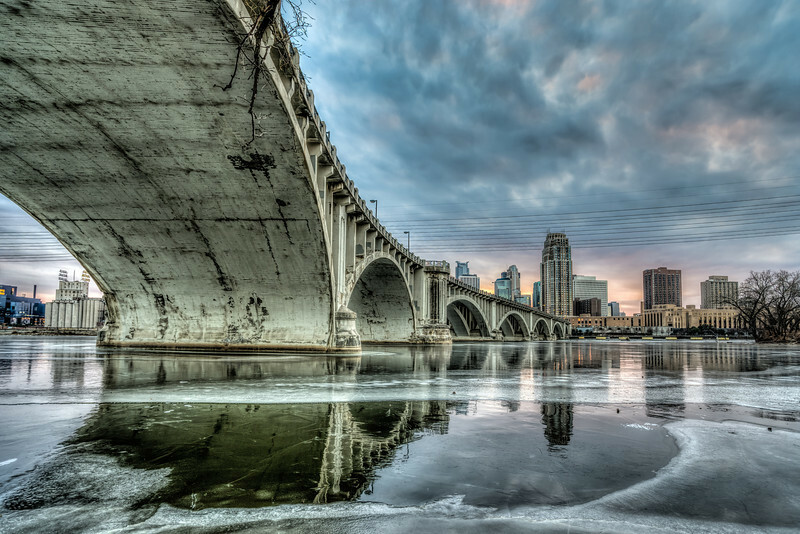 See more of the Third Avenue Bridge in the gallery. Don’t forget to Like my facebook page as well! Luv for the composition as well as the HDR. Reflections get me going too! Great shot. Thanks! So happy I found this location. It’s easy to get to but not many people know about it. At least not compared to some other popular locations. Nice colours: I like the cold tones. Which software did you use? Thanks! I processed the HDR through Photomatix as a 32-bit file and then re-imported into lightroom. From there I used the Brick Building preset in Topaz Clarity for the bridge and ice and then used the Beach Shore or whatever it’s called preset also in Topaz Clarity for the sky. Then I used layer masks in Photoshop to combine the two. Thanks for the explanation. I’m not familiar with the Topaz Clarity presets, but it’s a very good idea to create two different ones for the textures, like you’ve done, and then combine them with layer masks!